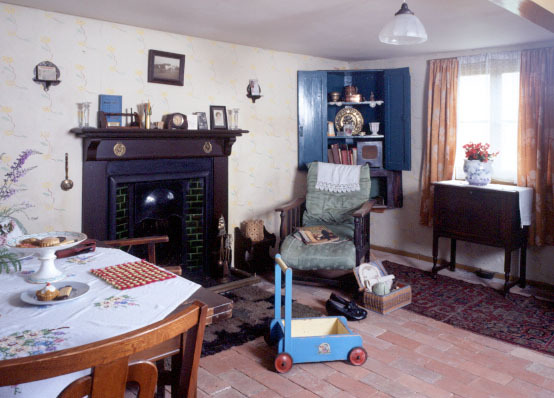 Welcome to Walnut Tree Cottage, a traditional farm worker’s family home from the 1940’s. Farm and in nearby Waterbeach village. When you enter the cottage’s living room discover what people did in the age before television. Peek inside the pantry cupboard and see what the Chapman’s would have kept there. Go through to the kitchen complete with it’s range which would have taken hours and a lot of muscle to blacken! Go through to the washroom/scullery and discover how the Chapman family washed their clothes. We invite you to climb the stairs by the front door and explore the two family bedrooms upstairs. Take a walk outside into the cottage garden around the side of the house and visit the family’s toilet privy (toilet!). 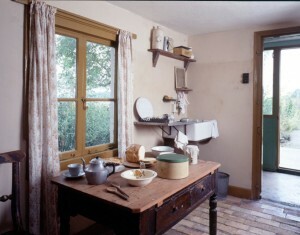 Many houses did not have a bathroom or inside toilet (privy) until the 1950’s. Privy’s were usually a separate weatherproof building, often some distance from the house. “Paying a visit”, to the privy was often called “Going to pick the daisies” or “Going to stack the tools”. Inside most people had a single seater with a lid (this was very important in the summer!). There was either a bucket under the seat which was regularly emptied or a deep pit.